Alma, Kansas, the Wabaunsee County Seat, is a small community rich in German heritage. Alma is part of the Scenic Mill Creek Drive, one of the most beautiful in Kansas, providing a panoramic view of both Mill Creek and the endless rolling Flint Hills country. Nestled in the beautiful Flint Hills, Alma is a stable community, surrounded by fertile farmland and bluestem grasslands. Mill creek winds through the area providing excellent fishing and canoeing along with the nearby City Reservoir and six federal Reservoirs within a 50-mile radius. The rural area abounds with excellent quail, prairie chicken, and deer. 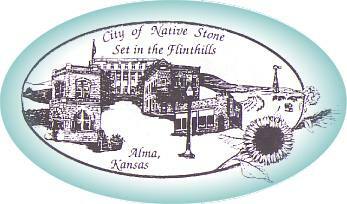 The picturesque town of Alma first was a site of the Indian Pottawatomie tribe. Later in 1858, the first white settlement emerged, mostly settled by Germans, with some Swedish, English and Irish. The Germans were the most permanent and the most satisfied with the hard life of the pioneers, and they remained, their Teuton names still pepper the town and county: Palenske, (German-Polish), Thoes, Treu, Zwan Ziger, Ringel Vobach, Stueve, Schmitz, Schmidt, Geisler, Mueller, Hafenstein, and many others who have lent continuity and substance to this vicinity. The town's name "Alma" has taken on controversial stories over the years. Some pioneers claimed it was named for the bloody battle of Alma in the Crime War in which Germans took part and some of its survivors later came to America. Others simply say that Alma was a pleasant settlement in Germany, remembered by the adventurers who left it. Another suggestion was that the name Alma means in Swedish, "A high place, frequented by Herds-men and by lovers." The latter name is at least, the most poetic, so we are willing to settle for that.